Due to its scale and complexity, this project came to be one of Baltz and Sons Concrete most challenging, but rewarding efforts yet. 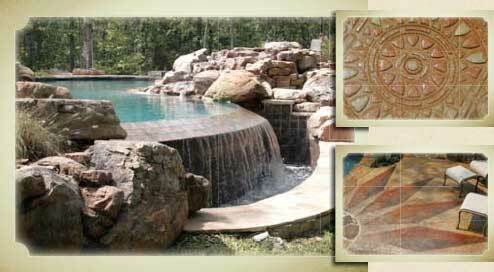 The homeowners wanted their pool to look as rustic as possible, as if it had been there all along. Thus, every aspect of its construction was carefully planned and executed in precise stages, with careful regard to minimize impact on the site. This posed the problem of maintaining consistency of the end product. Memphis Ready Mix stepped up to the challenge by providing specially designed mixes that provide consistent results. The concrete provided submerged platforms and monolithic foundations to serve as shelves for boulders, supports for waterfalls, stone veneer, vertical tree-wells, submerged “curtain-walls” (separating four different bodies of water) and a decorative finished deck. A rustic scored and acid-etched “sunburst” emanates from the recessed concrete fire pit and whimsically placed lizard stamps and architectural details accent the walkways and decking areas. Other concrete applications represented include exposed Ultra-Fiber 500 reinforced, white sand limestone mix, and a stamped and stained portion the seamlessly blends with the stoned area.